Not all the animals that burned in the fire had died, so the cowboys returned with shotguns in hand, and bandanas over their faces to ward off the stench. The animals had to be put down as quickly and humanely as possible under the circumstances. Everything in sight was covered with fine ash. The fires had moved fast, consuming the panhandles of Texas and Oklahoma, and parts of Kansas and Colorado. The Texas A&M Forest Service had reports of gusts 60 mile per hour. At those speeds, the livestock and wildlife were helpless to outrun the fire. Many burned to death on the spot. “You could see the glows coming over the hills,” Jody Bryant told Gizmodo. “Just closer and closer.” Bryant is a rancher in Laverne, Oklahoma. On March 6th, his whole ranch burned. Bryant was caught on the wrong side of the fire line that night. As the flames roared inching rapidly through the darkness, Bryant’s brother, a firefighter, broke though and rescued him. “We were lucky,” he said. His nearest neighbor, living a few miles away, wasn’t as lucky and suffered burns to his face and hands. A trucker just north of the state line in Kansas crashed his rig in the haze before succumbing to smoke inhalation. And in Gray County, Texas, a hundred and forty miles to the south of Laverne, three people were killed by the fast moving flames. The fires came just weeks after a series of fierce winter storms. It took fire fighting crews spanning four states more than a week to finally end the inferno. Often, the fires moved too fast to fight through conventional means such as water directed at flames and the surrounding area. At one point, the FAA had to ground fire-fighting planes because drone camera pilots, eager for a glimpse of the devastation, were getting in the way. The residents of those four states are not strangers to grassfires. They’re a common sight in the dry seasons of winter and summer. On the Fourth of July and New Year’s Eve, as fireworks pop loudly in the dark, ranchers will settle into their water trucks and mosey along the perimeter of their land, eyes searching for small fires accidentally started by one stray firecracker. “This is the season for it,” said every official, fire fighter, and rancher I spoke with. There is still no consensus on what sparked the blazes. Investigators working with the Texas A&M Forest Service had submitted their findings to local law enforcement, and a representative told Gizmodo there appeared to be nothing that indicated malicious intent. So they could have started from a cigarette carelessly tossed from a truck, or the spark from a train, or power lines clashing together in the winds. When the fires finally had their fill of the land, an estimated 1.6 millions acres had burned according to the National Interagency Fire Center. This was the most acres burned this early in the season since at least 2007, and Philip Truitt of the Texas A&M Forest Service, an organization that coordinates fire fighting efforts across the state, said this was the third largest fire in the history of the organization, outmatched only by a blaze in 1998 and another in 2006. And while the Great Plains can often account for a “notably high fraction of U.S. land affected by fire” according to Jeff Masters of Weather Undergound in a conversation with Gizmodo, this year’s fires were particularly fast. They also came just weeks after a series of fierce winter storms. Jody Bryant lost power for nearly two weeks in a late January ice storm that also saw almost two inches of rain fall in the Texas panhandle. But that rain wasn’t enough, because in February the same area was hit with a blistering heatwave so hot it would have been out of place on some summer days. “The states affected all had a top-five warmest February on record, which helped dry out the vegetation and set the stage for the fires,” Masters told Gizmodo. In February, temperatures hit 87 degrees Fahrenheit in Laverne, Oklahoma. The average high is just 62. Then in March it crept up to 91 degrees when the normal high is 66. The heat, and accompanying low humidity, exacerbated the usual winter conditions where grasses go dormant and “cure,” turning brown until the first big rains of spring. Between the heat and the wind the four state area was a tinderbox. “It was a perfect storm,” a representative from the Oklahoma Cattlemen’s Association told Gizmodo. And that, according to Truitt, is unlikely to abate in the short term. “Thursday is a high fire danger for us,” he said. And the chance of more fires, as big and destructive as this series of blazes, will remain high, at least until the region gets rain. 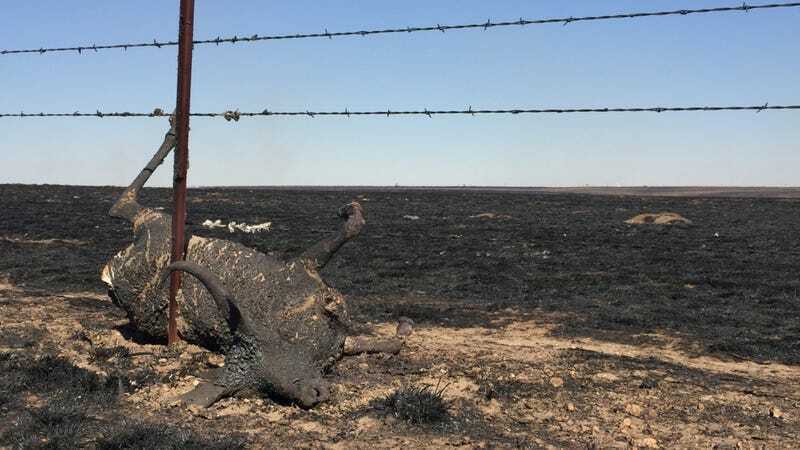 For now ranchers are committed to recovering from the enormous blaze. Surviving cattle suffered from countless injuries, including damage to their eyes, smoke inhalation, and burned udders. The last will be especially trying as this is “calving” season, when many cows give birth. But fire ecologists like Dylan Schwilk of Texas Tech is optimistic. “There’s a huge effect in the short term” he told Gizmodo, “but the data suggests these are barely minor effects on the long term.” The land will recover. The fires thankfully moved fast enough that the root system for the grasses of the Great Plains should remain relatively intact. Which means lush green grass once the rain comes—if it comes.